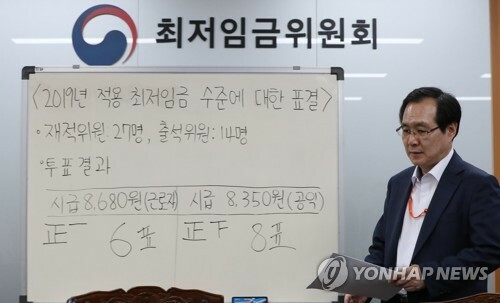 South Korea's minimum wage for next year has been set at 8,350 won (US$ 7.37) per hour, up 10.9 percent from this year, officials decided on Saturday. This year's minimum wage stands at 7,530 won per hour, up 16.4 percent from a year ago, the biggest hike in nearly two decades. The minimum wage for next year increased by a smaller amount, and experts are speculating that the council is controlling the level of the hike following criticisms that small business owners are suffering from increased labor costs.